How did your career as a photographer start ? When I was at TRP I met the man who would become my mentor,he even sold me my first camera,about three years later we had both left TRP and gone our seperate ways,however one night at a Rory Gallagher concert in Croydon our paths crossed and I was offered a job to manage his studio,which I did for one year before he went to live in the USA. Did you, or do you still have mentors ? His name was Fin Costello and Fin became known as one of the world's top Rock photographers, it gives me great pleasure to say we still are in touch with each other all these years later. Generally speaking, how is Rock Photography apart from general photography? What skills does it particularly require ? Rock photography differs in technique from other types, you must use fast film set ups as you are relying on stage lighting to get your pics, in fact the first AC/DC pics I took have afill in flash because there was no real stage lights at the venue, the other trick with it is to wait for the shot, for example if someone jumps or leaps during the stage act, wait till they are in mid air and you can freeze the action. Otherwise its all luck and what you see through the lens. You are one of the first Photographer to shoot AC/DC in Europe in 1976. Your photo shoot session in London Nashville Rooms has become famous. How did you and AC/DC meet ? I was the first photographer in England to work with AC/DC because I worked for Atlantic Records in London,at the press office was a girl called Coral Browning and her brother was Michael Browning who was AC/DCs manager,when they first came over I was asked to work with them and we did live shows and PR shoots around London. In fact my studio was in Lancaster Gate and Michael did approach me about sharing the premesis with him and the band as they were looking for a London office, this would not have worked for me as we had various artists coming in and out of my studio at the time, one of my fondest memories is of Alice Cooper going across the road to get himself a sandwich, in full make up, luckily he didn't take the snake with him. Michael found an office for the band in Shepherds Market London, not long after this his wife gave birth and I went up to the hospital and took some baby shots for them.nt. Tells us more about the "Angus and Milk" session. Was that your idea ? 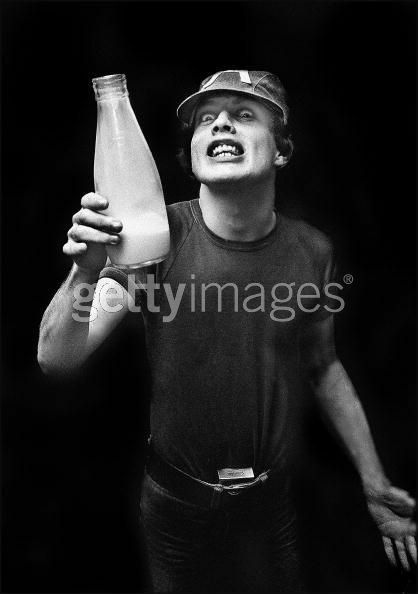 Angus and the milk was not so much an idea, more a reality, no matter where I went with Angus he was always drinking milk, it features in a lot of my pics of him, he must have very strong bones, thats why he can still run around the stage today. Had you ever heard of the band before you met them ? No I had never heard of the band before and my first impressions of them was as a nice bunch of aussies, they were really nice guys who always seemed to get on with everyone, especially Mark who was the bass player at the time. Do you remember what were your first feelings and thoughts when you first met the band ? 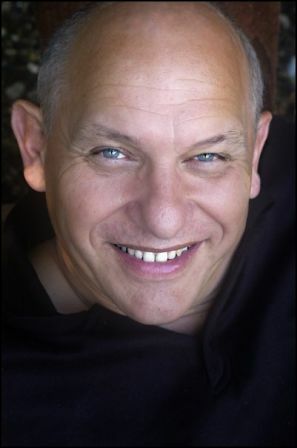 There was no ego's to deal with and we always had a laugh whenever we did a shoot. AC/DC on stage in 1976� is this a musical or a visual shock ? It was more a visual shock than anything, they were full off energy and no-one was baring there bum to audiences in 1976, sometimes they were so energetic it was hard to capture on film because the venues were small and so was the lighting, it must be much easier now with the big stadium's. What kind of equipment where you using at that time ? Did you immediately know AC/DC was rapidly going to become huge ? No I did not know they would become so huge so quickly, I had spent some time earlier working with the Heavy Metal Kids who were also a great band and stage show and they had unfortunately not made it, although Gary Holton the singer became a well known actor ion british TV. AC/DC were hard and raw and more than anything they were very hard working, they made it happen. Tell us about Bon Scott. Did you guys have the chance to chat? 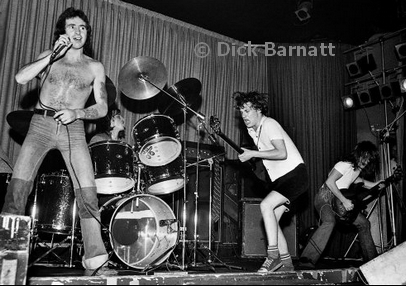 What kind of man was Bon Scott behind the curtain ? Bon Scott to me was just a very very nice guy, no ego, always smiling and joking. I do have a memory of him backstage after a show asking someones boyfriend what he thought of the show. The boyfriend was not over complimentary and a lot of rock's pre madonnas would have thrown a tantrum or stormed off, but not Bon he just said ' each to there own mate' and offered the chap a beer. Bon could drink and party but he was nobody's fool. What are your best and worst souvenirs as a music photographer? Which band is the easiest to work with, which one is the worst ? I don't really have any souveniers except signed albums and promo material but I do have treasured moments, the best one I remember was going up the steps a Earls Court with Led Zeppelin, I was going to the photographers pit at the front of the stage, they were going onstage, as we reached the top of the stairs they walked onto the stage and I could feel the applause coming straight at me, as for the bad ones I remember getting stranded abroad a few times but nothing too bad. You do have a real artistic signature. Close framing, focus on the eyesight, brightness. Is this an innate style or a technic you developed over the years ? I don't have a signature as such I just try to make them interesting and in focus. How do you chose between colour and Black & White ? In those days it was more black and white for the music papers, nowadays its more colour as the music papers use more colour than Black and White, plus with the digital age you can easily convert colour to black and white. Have you ever been in a situation in which you really felt the frustration not to have your equipment with you ? There are a million times when you wish you had a camera, but thats the same for everyone. How did you react to Bon's death announcement ? Obviously I was very upset when Bon died, it such a shame he missed the real big time, plus Bon was more than just a guy who had a few drinks and ended up dying in that way, as I said earlier, he was a really nice genuine guy. What did you think about the choice of Brian Johnson at that time ? I didn't really think of Brian Johnson, I always thought Bon sounded like Dan McCafferty from Nazareth,but as it turned out Brian was the right choice. What are your 3 favorite AC/DC albums, why ? My current projects are now in travel, I have just finished a book on the Trans- Siberian Express. Can we ask you if you would offer us an unseen picture of the band. Be sure our community would appreciate the true value of it. I will organize an unseen photo for you. Do you have a message for http://www.highwaytoacdc.com and its members ? I would just like to wish all the fans my very best, they are the reason why I am still selling AC/DC photographs to magazines all over the world 34 years later.